Research group found pollinators of marine life swarming on turtle grasses. As we celebrated World Bee Day on the 20th of May for the first time it seems appropriate to look at pollinators: the role they play and where and what they are. Most people may not know this, but pollinators are not limited to land only, yes we can find them in our oceans too. 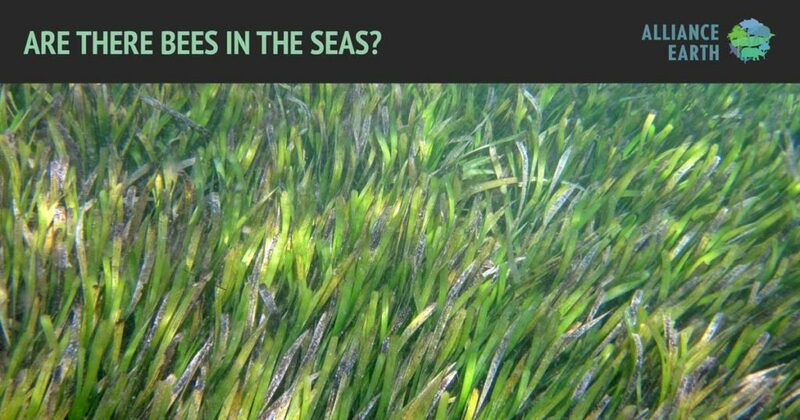 Believe it or not there are grasses under the sea that too shed pollen to reproduce. While in the past we have assumed water performed pollination tasks, there are in fact ‘bees of the sea’. A study of underwater ecosystems discovered that there are pollinators who perform the same function as bees on land. The study conducted by marine biologists found sea flora pollinated by animals, though they are not really bees; they are in fact microscopic crustaceans and tiny marine worms hard at work. The research team at the National Autonomous University of Mexico, led by Brigitta van Tussenbroek, recorded video footage of tiny invertebrates moving through a bed of underwater turtle grass. These creatures swarmed the grasses like bees would swarm a flower, being drawn to the male flowers, and with the frenzy of the movements moving pollen between flowers. At the time it seemed that they were pollinating but the scientists were not sure. By recreating an aquarium based experiment they proved that without current the seagrass only flowered when visited by the ‘sea bees’. One researcher wrote of the seagrass species: “With this experimental evidence we demonstrate that marine invertebrates are pollinators of T. testudinum, revoking the paradigm that pollen in the sea is transported only by water.” This phenomenon has been named zoobenthophilous pollination. It was an amazing find as these seagrass meadows are foundational shallow-water habitats and amongst the world’s most productive ecosystems: they improve water transparency, store carbon and stabilize coastlines. Understanding more about how they are maintained helps us protect them better. It can be said that pollinators and bees play a key role in creating almost all the natural beauty we see around us. Cast your eyes across different landscapes, chances are that pollinators are responsible for almost all the colourful flowers or fruit you enjoy. Let us honour too on this World Bee Day our ‘bees of the seas’, these small crustaceans that, just like our precious bee species on land, also play a critical role in their aquatic ecosystems. As on land, so at sea. You can read the full article on the research from: Nature Communications: Experimental evidence of pollination in marine flowers by invertebrate fauna. This entry was posted in Did you know? and tagged Sea bees; AllianceEarth; WorldBeeDay2018. With 8 million tons of plastic ending up in our oceans as plastic waste each year, it’s time to look at the health of our planet as a matter of urgency.